Blackjack is a popular game that is played in casinos around the globe, and it can be simple to get your head round once you start to learn and understand how the game works. Blackjack is particularly easy for first-timers, which makes it a popular game for gambling beginners. 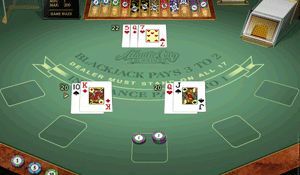 Blackjack only gives the house a small advantage and is a game that you can master by studying, which is one of the reasons it is so popular. This guide will tell you everything you need to know about blackjack, from the history behind the game, to the best strategy and tips to help you win. The history of blackjack is a largely contested subject that many researchers still to this day disagree on. Unlike other games, there is no one creator of blackjack and instead it has progressed from other games. The modern game that we know now as blackjack is thought to have originated and developed from games played in France and Spain during the 18th century. It was originally named “Vingt-un” or “Vingt-et-un (meaning 21) in France, but in Spain it was known as “Trente-un” (meaning 31), which can be traced back as far 1440. Blackjack, then known as ‘21’, was taken over to America by French Colonists in the 18th century where the rules were not standardized and often changed depending on the individual dealers. The game flourished and increased in popularity in America through the development of gambling establishments. At the time of the state legislation of gambling in Nevada in 1931, the game was still just as popular and had continued to be referred to as ‘21’. 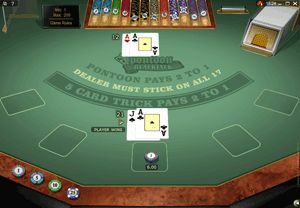 Some casinos targeted this game as a way to entice more players and would sometimes offer an exclusive payout of 10:1 when a player successfully got to 21 points by using the ace of spades card and one of the black jacks. This is where the name Blackjack was established and grew from. As states in America were starting to legalize gambling, legislation was introduced, and games needed to have a standardized set of rules. 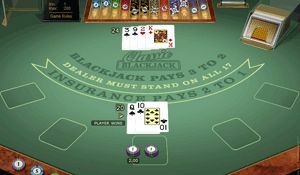 Up until this point, blackjack did not have a clear set of rules and was played differently depending on the players’ location or the individual dealer. However, the Nevada Gaming Commission created the official rules for blackjack, and those are the rules that the modern version of the game follows today. 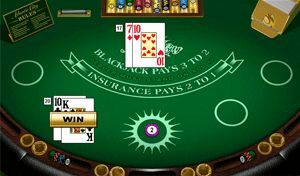 Blackjack has since been one of the most popular games to be played in casinos in Las Vegas, and the rest of the world. 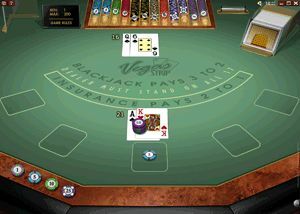 The game of blackjack developed further when technological advancements enabled the establishment of online casinos, which provided the classic version of blackjack virtually. The game of blackjack developed further through the growth of the internet and there are now different versions that are played interactively. One of the key things to understand when playing blackjack is the odds and probabilities that exist in the game. Regardless of the cards you have been dealt and what your predicament is at the table (whether literal or virtual) you need to be aware of the chances you have of winning, compared to the probability that you will go bust. Through studying and practicing the game, you will be able to work out the probability of going bust when you decide to add an extra card to your already dealt hand value. For example, if your hand value is 12, then you have a 31% probability of an extra card value sending you bust and out the game. However, if you have a higher hand value at 19, then your probability jumps up to an 85% chance. Once you get your head around these odds, then it will be easier to assess whether you should take the risk of adding an extra card. Putting it simply, the higher your hand value, the higher the risk an extra card will make you go bust. It is worth keeping this equation in your head while you are playing. However, the real trick to blackjack is to not just focus on your odds in the game, but also on the dealer. Now you need to remember that the dealer’s probability depends on what the game’s rules state. So, make sure you know the rules before you enter play. You may think that you have been dealt a weak hand, but also look at the odds of the dealer’s hand being weak as well and you will have a better idea of how to predict their hand successfully. Example: you could have the hand value of 11 and assume that the right thing to do would be to hit. You would consider this to be true because not only is 11 a low hand value, but you know that more than two thirds of the rest of the pack that you could be dealt from would help improve your value. But don’t forget that the dealer may have a weak hand too! Do not make the common mistake of only focusing on your own odds and probabilities. YES. Like any other casino games you need to make sure you play exclusively on safe sites. At Canadian Gambling Choice we only gathered trustworthy online casinos! Peace of mind, safety and fun ahead! YES you can. You'll only find online casinos with real money games at Canadian Gambling Choice. Check our strategies & tips to make the most of your blackjack experience. YES, online gambling is totally legal in Canada, you just have to make sure you're playing with the best and legitimate online casinos such as Yukon Gold, Luxury Casino or Zodiac Casino! Blackjack is one of the most popular games played in casinos and this is because, while being relatively simple, it offers a thrill and the player can use mathematical ability (through the assessing of odds) in order to develop a high-level strategy. Before you can develop a high strategy, you need to first know the basic game rules. The standard 52 card pack is used for blackjack and most casinos play the popular version where six packs are shuffled together (to make for 312 cards in total). However, not all these cards will be played as after the cards have been shuffled and bets placed, the dealer will pick a player at random to cut the pack of cards so that the last 60/70 cards will not be in play. The object of the game is to beat the dealer by getting as close to the count of 21, without going over (known as going bust). The betting aspect comes to the game as, before the cards are dealt, each player places a bet by placing a chip in the designated area. The value of the chip(s) you place down is up to you, but there are generally minimum and maximum bet limits that start from around $2 to $500, but this depends on the betting establishments rules. When the first cards are dealt, the dealer will give each player one card facing upwards, and then give himself one card facing up. The second round of cards are delivered to players face up, while the dealer’s second card is placed face down. Playing from the left, each player must decide whether they want to stand or hit. This means that a player can either stick with the original two cards that they have been dealt, or they can decide to have additional cards from the dealer. The player will then either stand if they have a hand value of 21 or under or go bust if they exceed the 21 goal. If the player loses by going over the value of 21, then the dealer collects the bet they wagered. The dealer serves all the players in the same way and once this has been done, they will turn the down facing card up so the table can see his total. If the total of his two cards is more than 17, then the dealer must stand. However, if the total is under 17, then the dealer will continue to take cards until a value of 17 is reached. There are different strategies that are followed, but one of the main ones that nearly all players begin with is based on the dealer’s up facing card. If you can see that the dealer’s card is a high value (for example between 7 and 10) then the player should take additional cards until their value is at least 17. The main strategy behind this, and the whole game, is to not take an extra card if there is any risk that it could make you go bust. A popular strategy is the use of blackjack pair splitting. If a player is dealt two cards of the same value, then they can decide to either continue playing with those card values, or they can split them into two playable hands. Now, a player getting two cards of the same value can be beneficial as well as damaging. For example, if two 10s are dealt to a player, then they have a strong hand they will want to stand with. However, being dealt two ‘2s’ can be less beneficial and the player may indicate to the dealer that they want to split the pair into two hands but place another equal bet by the original bet they placed. But make sure that you place the second bet NEXT to the original bet and not on top of it! The player should also remember that they must play out the original hand they were dealt before they can play their split (second) hand. Some games will see the inclusion of side bets. These are additional wagers that can be placed only at the beginning of the game when you play your main bets. Side bets can be placed on both your own hand, and the hand the other players will be dealt. The most popular side bets are perfect pairs and insurance. However, it is advisable to avoid getting involved in side bets as they generally have a higher house edge compared to the game itself, so it really is recommended that you avoid them. Tip: Most blackjack games are paid out at a minimum of 3 to 2 for a blackjack, but some casinos have increasingly started to offer games that only pay out 6 to 5 for blackjacks. This increases the house edge by 1.39% which makes the game a bad play, and one you should be avoiding. A way to give yourself the upper hand when playing blackjack is not only to develop your understanding and strategy, but also to make sure you know what all the different terms mean. Here are a few of the most common terms you will hear and use while playing a game of blackjack. This is a card in the pack which the player can decide to count as either a 1 or an 11-value card. It is assumed that if you have a hand value that does not exceed 21, but includes an ace, then it is counted as 11. The designated area of the table layout where the player places their bets (in the form of chips). When a player’s hand exceeds the limit of 21. This is a technique used by some players that are trying to hide that they are counting cards as a form of strategy. 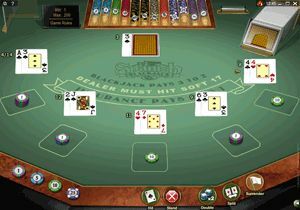 Some players keep a track and ‘count’ the cards that are in play so they can work out whether an individual card being played will be advantageous to them. This refers to a hand that does not contain an ace, or if there is an ace then it counts as a one value, instead of an eleven. 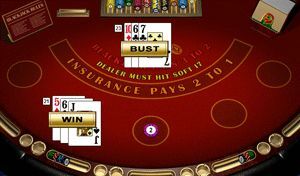 A hit is when the player asks the dealer to give them an additional card. The proportion/percentage of a player’s bet that the casino theoretically expects to win or lose. also known as “blackjack”, refers to a player’s first two cards being an ace and a ’10’. A natural means the dealer automatically pays the player one a half times the amount of the bet they originally put down.